Thanks to Noah Stokke, Teen Leader, for contributing to the blog! 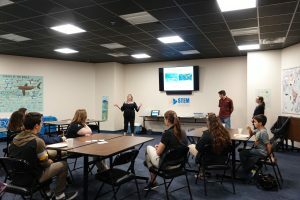 On November 26th, Dr. Jessica Dutton of Texas State University, along with her graduate student Jacob Ketchum, spoke to the Texas State Aquarium Teen STEM Café on the mercury levels in a shark embryo. Mercury can be a problem not just for sharks but for many sea creatures and humans as well. Why is this a problem? Mercury is toxic, and if an organism is exposed to high levels, it can harm the brain, heart, kidneys, lungs, and immune system. One way sharks and humans can get mercury in their systems is diet. If a shark eats a fish that has high levels of mercury, the shark will receive that mercury. It would make sense then that sharks have a higher risk than other animals if their diet consists of fish with high mercury content. Dr. Dutton studies a second way mercury is transferred to sharks. During gestation, the mother can transmit the mercury in her body to her pups. How a shark embryo is connected to its mother depends on the species. Sharks lay eggs, are connected to their mothers via placenta, or have yolk sacs inside of their mothers. 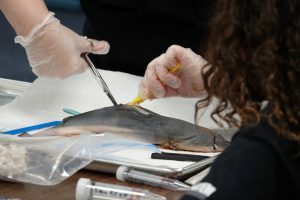 Dr. Dutton and her students are studying the differences in mercury levels in shark embryos that are connected to their mothers via a placenta and comparing them to shark embryos that are not connected to their mothers. Jessica and her students dissected shark embryos in front of us, but before they did that we got to hold what is essentially a baby shark. Holding the embryo and admiring its features was the highlight of the night for me. Then they began taking samples of the embryos to test for mercury levels. First, they cut the fin off and put it in a test tube to bring back to the lab. They also took samples of the heart, liver, skin, kidney, brain, and muscle. The teens got to help with bagging the samples. They actually used those samples for their research, so if they lead to a major discovery, we could say we took part in a scientific breakthrough. 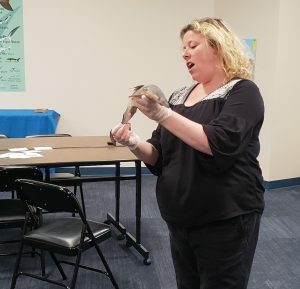 Or we could just say that we held a baby shark and have that be cool enough!